Prevent the first meat damage each turn. Light and form-fitting, its like bulletproof skin. A card that would be great, if not for its careful, or possibly careless, wording. The simple fact is, if you're putting several copies of this in your deck, you're probably doing it in the hopes of defense against Scorched Earth. But this isn't the case. Notice the words "the first." That means no matter how many of these you have installed, you will only prevent one meat damage per turn. Just as I've Had Worse won't save you from Scorched Earth if you have 3 or less cards in your hand, 3 of these will do nothing more to save you than a single copy. So you might be asking, "Where is this is useful?" Argus Security: Protection Guaranteed is considerably less threatening with this installed. Traffic Accident is also less painful, as if having two tags wasn't bad enough (unless they're from Breaking News), but I'd much rather have Lawyer Up or Decoy. Overall, there are much better options. If you're worried about not having enough cards post-damage, Anarchs have I've Had Worse, which also works against net damage, with the only caveot being you might have other cards in your hand. Other factions have Public Sympathy, which offers more utility than MB, and costs only 1 more. And if you want to avoid meat damage altogether, the aforementioned Plascrete Carapace and Crash Space are frequently better options. This card is still probably outclassed by Plascrete Carapace in most situations, but requires some consideration if Weyland Consortium: Builder of Nations becomes a menace. This will entirely interrupt the ID ability and also provide a light benefit against Scorched Earth! Only a higher power or perhaps a Beach Party will save you from hell on earth, though. As noted, it's a fine addition against Argus Security: Protection Guaranteed in case that gets more popular, as well! At 1 influence, it's also well worth considering going forward for an Anarch or Shaper that wants to run lighter on cards. Just don't install two. It might as well be unique. One of the most underplayed cards imo. 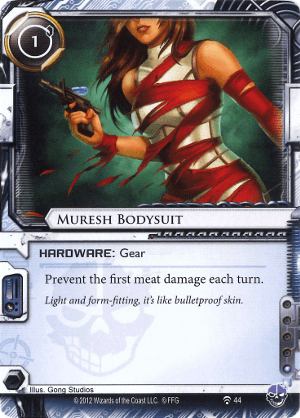 Each time you prevent a meat damage it's almost the same as if you drew a card, and runners get to draw cards at approximately the same rate as they can get credits. So this card basically gives you a credit per turn. Most runner economy cards are finite-use, like daily casts, or require heavy click investment, like magnum opus. The only other comparable card, underworld contact, is more expensive to install and makes you build your link before it starts working. Any runner looking for infinitely repeatable economy should give this a chance. While this card correctly gets a low rating it should be noted that this card can in fact save you from double Scorched Earth when you are playing either Brain Cage or Box-E and having a full hand. As criminal you can that way save 2s instead of using Plascrete Carapace and still go tag-me. allowing you to tutor up hardware in criminal! Maybe one day we can see criminals have enough influence for using such janky possibilities. If you feel adventurous try this when you're packing Silencers and Switchblade and see where it can take you.